Bartlett Mitchell is proud to support the British Beekeeping Association and so it was great to catch up with Rob Allen one of our own Chefs and first-time beekeeper and see how his first year as gone. Over the years it has become apparent that bees are struggling. A little known fact is that if bees died due to pesticides or global warming, mankind would only survive for four months until all plant matter died. So it is important that we protect our little pollinators. In the UK alone we have over 250 types of bee however Beekeepers only farm one type of bee Apis mellifera. These Honey Bees are wild, semi domesticated Invertebrates who live as a colony and work together. This year samples of pollen and honey from our bees have helped Surrey University’s research into the use of bee products in antibiotics for humans. Raw honey has properties that can help the immune system with conditions such as hay fever. Having moved to a house with a large garden, we decided to invest in our first hive. Once we built the hive, we decided to do a course in beekeeping. 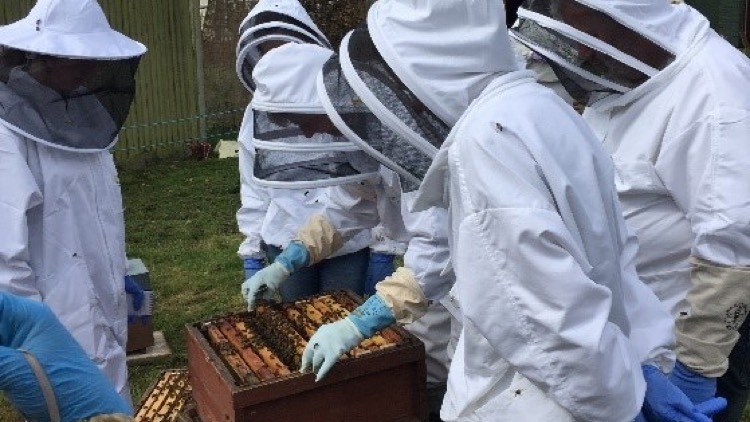 Our course consisted of 16 budding beekeepers from all walks of life and involved ten Monday evenings during winter for learning the theory of bee keeping and ten weeks from April in our local Teaching Apiary in Hersham with hands-on learning. If you’re thinking of keeping bees, I recommend a course as the subject matter is fascinating. There are 140 beekeepers in my area near Woking, some with just one hive and others with up to 34. We ordered our bees from West Sussex, so early in May I drove down there to pick them up. Believe me it was a careful drive back with approximately 8000 bees in a polystyrene box (NUC). This consisted of a Queen who lays a few hundred eggs a day, drones which are the males, with the rest made up of the female worker bees. Once the bees were home we had to transfer them from the NUC to the hive. So, suited up, we poured the bees into the main hive!! Bees do not take a lot of looking after. A check once a week to ensure there is no sign of disease is fine, as well as checking there are no signs of swarming (when the queen decides to leave with half the bees). The Colony grows very quickly between April and August. By this time the hive will consist of one Queen (with a paint spot on her back for quick location), several hundred drones and tens of thousands of infertile female worker bees – approximately 80,000 in total. The Queen lives in the lower chamber- the ‘Brood Box’ – separated by a mesh that she cannot pass through. The boxes above are called ‘supers’ where the Honey bee does its magic by first making comb, then filling it with nectar and honey. It wasn’t long before I built my second hive and collected a swarm from the local swarm collector to create another colony. With enzymes provided by the bees, the nectar soon evaporates until the moisture is low enough for it to thicken and become honey. It is stored in the Supers until harvested. We only harvested one hive of honey as our new swarm had not yet produced sufficient honey. Gingerly following the notes from my course, we started spinning the honey in a borrowed extractor. Once the surface of the comb is cut it is spun in a cage that centrifugally separates the honey. It is amazing considering the food regulations we adhere to in catering, that the rules for amateurs making, bottling and selling honey are very relaxed, as long as the labels are correct we are okay. As a small bottling exercise we found the best way to fill the jars without creating a sticky mess was to use a piping bag.